Gandhinagar is the capital city of the state Gujarat, India. It is situated 23km north of Ahmedabad, the largest city of the state. Located on the west bank of Sabarmati river, Gandhinagar is divided among thirty sectors. The city is full of green parks many recreational places. Gandhinagar remains hot and dry during summer with its temperature ranging from 36 to 42c while it moderately cool during winter as its temperature ranges from 14 to 29c. Places to see: Gandhinagar offers its tourist many places of interest. 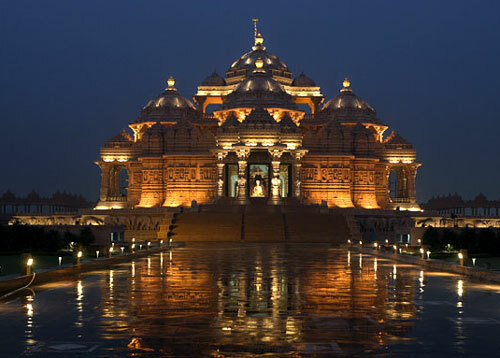 Akshardham is one of the most popular tourist destinations in Gandhinagar. The temple is built with yellow stones and has beautiful carvings. The temple is surrounded by beautiful garden and fascinating fountains. Capital complex is a place in Gandhinagar which houses many government offices and legislature. 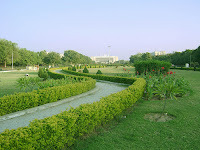 Sarita Udyan is a popular picnic spot in Gandhinagar. It is very lovely place where one can spend time. Deer park is yet another popular spot in the city. Deer park is also known as Idroda Park as it is mainly located in Indroda village near the city. 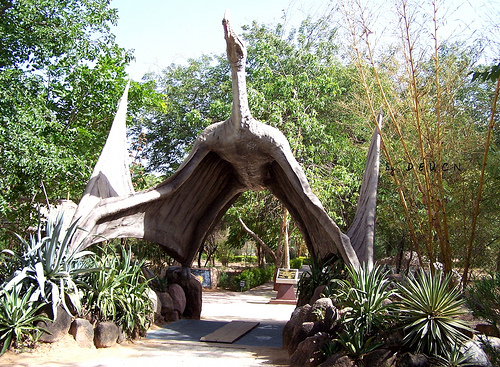 The park has various sections like Jurassic park theme, snake park, deer park; bird park etc. big statues of Dinosaurs have been kept there with detailed information. Snake Park houses many different kinds of snakes. The park also has an aquarium with many varieties of fishes kept in. Pethapur village is located 7km away from the city and mainly known for its famous Bandhani saris. The village is known as Craftman’s Village. Mahatma Mandir of Gandhinagar is located in the sector13. It contains museum, convention center, food court, exhibition center etc. Rail and road link the city to other parts of the state and the country. Trains connect the city to other cities of the state and the country. National highway connects the city to Surat and Mumbai. Many state run buses and private luxury buses are available from other cities and towns of the state to reach Gandhinagar. Nearest airport is located in Ahmedabad. Many flights connect the airport to Mumbai, Delhi, Bangalore and other major cities of the country. All major festivals are celebrated in Gandhinagar. Festival of Navaratri is celebrated full zest for nine days. During the festival local people perform the Garba the folk dance of the state. They also perform their other folk dance like the Ras and Dandia.